Here is a video you should watch. It features, up and coming singer songwriter, Lianne la Havas strolling through the streets of Paris belting out her soulful, folky music. That was all I needed to see to get hooked. Is Your Love Big Enough? continues to showcase Leanne’s talent for songwriting with slow jazzy songs like “Lost & Found,” and upbeat funky songs like the title track “Is Your Love Big Enough?,” and everything in between. 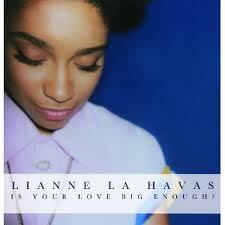 Clearly this girl is a very talented guitar player and a great singer and I think this album is a fantastic collection of songs that could lead to some big things in the future for Lianne La Havas.